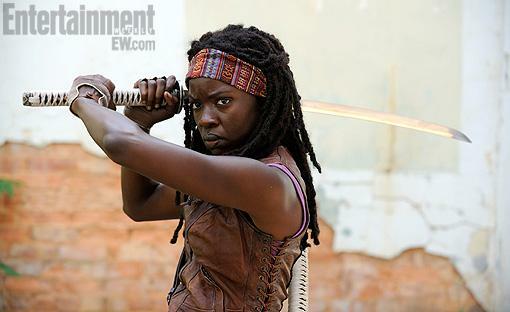 EW has released the first look of actress Danai Gurira as the fan favorite katana wielding character, Michonne, who will make her debut in the Season 3 of The Walking Dead series. She actually debuted at the end of the Second Season, but only with her face hidden by a hood. How will the live action version of Michonne differ from TWD comic? The essence of the character — her personality, her motives, everything that makes Michonne Michonne — remains intact from the comics. But like a lot of things on the show, there will be little tweaks and differences here and there. We saw that her introduction is slightly different from how it was in the comic, and her interaction with Andrea is really going to be a really cool addition to the character that I think will get television viewers up to speed, and they will get to know her a lot faster than comic book readers did.